Earrings “Angel's Hair” - RESERVED!!! Rutilated Quartz aka angel’s hair is a perfect lightbearer that enlightens the soul and facilitates spiritual growth. It brings the light to the cellular lever and preserves it there. It’s a powerful group of minerals sizzling with energy! It strengthens intuition and helps to realize whether others’ intentions are good or evil. In addition, rutilated quartz helps to remain focused and keeps the head clear so that we can carry out our ideas and plans. Rutilated quartz can be found in different colours, starting with red and ending with golden “needles”. 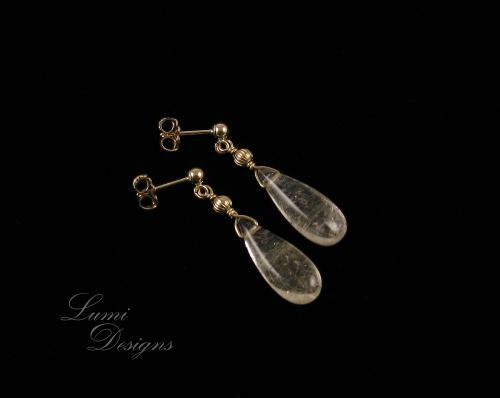 Rutilated quartz can be found both in clear quartz and smoky quartz. Smoky quartz has gentler influence than clear quartz because it has a grounding effect. Red and brown “needles” help bring higher vibrations to the body and remove roadblocks from health and prosperity. Orange and golden “needles” activate creative energies and the ability to have divine inspiration. Silver “needles” increase intuitive abilities. Rutilated quartz helps to remove etherial blockages before they come down to a physical level. What means gold-filled? Read from HERE!